As operational companies need to ensure maintenance and energy costs are kept as low as possible whilst keeping plant downtime to a minimum, there is always a balancing act which directly impacts the final price per ton. Quarry Mining’s solution to absorb and reuse excess electrical energy from material transported on downhill conveyor systems reduces the overall energy cost to zero in addition to generating additional electrical power. This energy saving from Quarry Mining? ?™s uniquely designed and custom-tailored conveying system enables total transportation costs per ton to be reduced dramatically. One of the most important tasks was the partial downhill route of the conveying system. In order to prevent the system from overspeed caused by natural gravitation force, the potential energy has to be “pulled out” of the system. Thus, a control system with an electronic braking system was developed by QM. With this system, it is possible to brake the downhill conveyor electrically and wear-free. In addition, the potential energy of the material is converted into electrical energy, which is then fed back to the grid and can be used for other plants. With this innovative solution, a negative energy balance of the conveying system can be realized. This means not only that the material transported is completely energy free but also that electrical energy can be generated from the transportation. In case of power failure, a special braking system ensures the safe-stop of the entire operation; highest safety standards are employed at all times. Frequency converters are used as a driving unit to ensure smooth start and stop of the >700 m long conveyors. As can be seen with the full load in the above figure (bottom, right), the energy demand is negative and energy is generated in addition to the material transported. The feedback capacity depends on the height difference between head and tail drum. The larger the height difference, the bigger the energy generation. 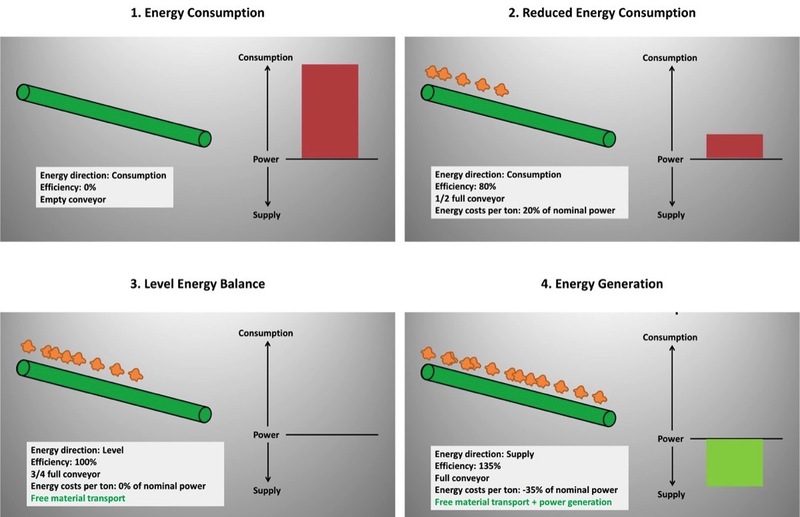 Power generation increases with the more material that is on the belt because more material will create a higher potential energy and will “drive” the belt more. It is therefore a win-win solution; the higher the quantity of material, the larger the energy savings. Such a system can be realized whenever material needs to be transported downhill. This solution, engineered, designed, manufactured, installed and commissioned by Quarry Mining LLC is a unique, innovative and future-oriented solution provided to the client. It is sustainable, extremely environmentally friendly and reduces the energy costs dramatically. Quarry Mining LLC (QM) design, manufacture and install Crushing and Screening plants in compliance with European standards, while adhering to the same safety standards and features that you would expect of equipment produced in Europe. QM is certified for quality management by ISO Certificate 9001:2008 and for environmental management by ISO Certificate 14001:2004 from the German Technical Inspection Association TÜV Rhineland/Germany, and includes the continuous integration of all upgrades. QM is founded and managed by German Nationals but located in the United Arab Emirates. QM can supply high-quality plants at very competitive prices.